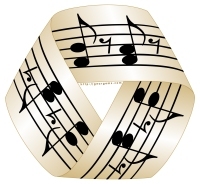 Similar to our Endless Afterbeats design, Endless Beats shows that the music never stops, or that the beat goes on, or whatever descriptive phrase you can think of to describe this moebius strip of endless notes in an eternal loop. Buy this great image on a t-shirt, hoodie, mug, bag, or other quality giftware or apparel item, exclusively from GearGems! The products pictured in the carousel (please click here to see them all at once) are printed by Zazzle, where you can CUSTOMIZE them with your own caption or other text or images if you wish!